Black Friday deal: Save on five-star Denon D-M41DAB micro system | What Hi-Fi? If you're in the market for a compact hi-fi system that can do it all, then look no further. The Denon D-M41DAB is the one to go for, even without a price cut, but thanks to the Black Friday madness, you can currently save a hefty £100 for good measure. Irresistible. Denon's micro hi-fi systems win What Hi-Fi? Awards pretty much every year, the company having perfected form and function with its mini music systems. This year the Denon D-M41DAB added wireless Bluetooth music streaming, giving yet another way to enjoy the system's great sound. 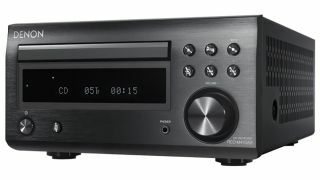 There's also a CD deck, analogue and digital inputs, and DAB and FM radio. The deal below sees the D-M41DAB down £100 from £279 to today's price of £179. This is for the main unit, allowing you to add any speakers you like.